USS Laffey (DD-724) is an Allen M. Sumner-class destroyer, which was constructed during World War II, laid down and launched in 1943, and commissioned in February 1944. 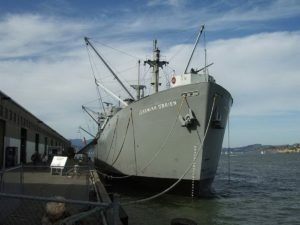 The ship earned the nickname “The Ship That Would Not Die” for her exploits during the D-Day invasion and the battle of Okinawa when she successfully withstood a determined assault by conventional bombers and the most unrelenting kamikaze air attacks in history. Today, Laffey is a U.S. National Historic Landmark and is preserved as a museum ship at Patriots Point, outside Charleston, South Carolina. USS Laffey (DD-724) is an Allen M. Sumner-class destroyer, which was constructed during World War II, laid down and повече "
Република Ф-84 "Тандерджет" е американски изтребител-бомбардировач турбореактивных самолети повече "
M3A1 Stuart CountryUSA RoleLight Tank Built22000+ The M3 Stuart, officially Light Tank, M3, was an повече "
The 8 inch (203 mm) M110 Self-Propelled Howitzer was the largest available self-propelled howitzer in the United States повече "
Компания dassault С. М. 450 Ouragan е първият френски-разработена изтребител-бомбардировач серийно производство повече "